If you, like me, have been a fan of Blogger and it's oh-so-easy to use platform these last few years, you may have been shocked to learn that the little box of friendly faces you see in your sidebar would be disappearing on the 1st July. Now I have seen countless blog posts on this by a range of my favourite fashion bloggers and I can happily say that information was incorrect! Google Friend Connect isn't going anywhere, its staying put! In fact so is the Blogger Reading List at the bottom of your dashboard. Phew! Because for a minute there I was seriously considering switching to Wordpress, and since I've only just designed this new layout I didn't fancy spending weeks getting a headache over blog platform migration. The only thing that is actually going is Google Reader, which is this. If you follow blogs via Google Friend Connect you automatically have those blogs appearing in your Blogger Reading List (on your Blogger Dashboard) and in Google Reader. However, once Google Reader is discontinued you'll still have those blogs appearing on your Blogger Reading List on your dashboard. So you can see where all the confusion has come from! Thankfully, if you're following blogs like this via Google Friend Connect you have nothing to worry about, and if you have a blog on Blogger you don't have to fret about your followers disappearing either! Please be aware that if you do only follow blogs on Google Reader then you should look for an alternative reader platform as this will be disappearing from 1st July. Google Friend Connect (you can follow this blog via this on the left hand side). Bloglovin (you can follow this blog here if you'd like). Flipboard for tablets and smart phones is a great alternative, and is rather like reading a magazine. Follow via social media! Bloggers are always updating their social platforms with updates about their blogs. Follow via Twitter, Facebook, Instagram, Pinterest etc. You can follow my blog via social media if you click on the buttons on the top right. Although Google Friend Connect is not going away 1st July, it may disappear in the future. Google has come a long way since I've started this blog and Blogger hasn't really changed that drastically. I love the rawness of it though, I wouldn't have been able to design this template otherwise. 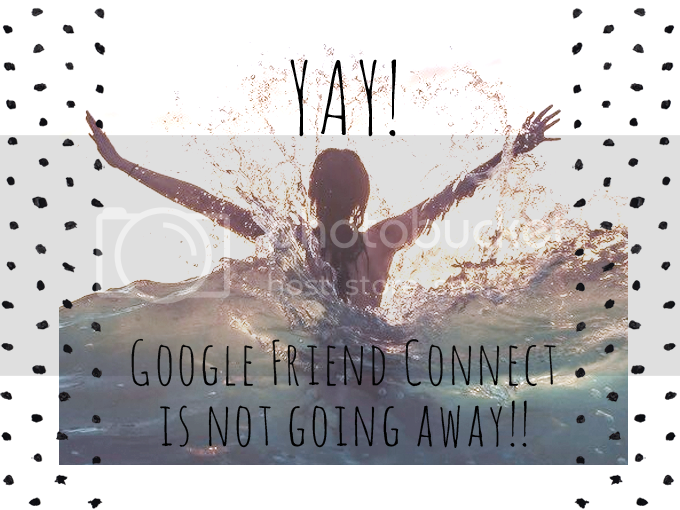 I'm kind of hoping they'll update Google Friend Connect to be better connected with Google+ rather then losing it altogether. There are also rumours flying around that RSS Feedburner may be going soon too. It does seem very out of date, and difficult to personalize, so I wouldn't be surprised. Moving on I'd consider creating weekly newsletters instead of offering a RSS feed. A little weekly email packed full of extra visual goodies. Sound good? Perhaps I will migrate to Wordpress in the next coming months. Having worked on various blogs in Wordpress as well, I do feel as if Blogger is missing something now and fashion blogs especially usually start off in Blogger, but eventually migrate to Wordpress for many different reasons. I really hope you have found this blog post useful. I know it has been a little off topic, this being a fashion blog in all. I have seen a lot of bloggers panicking about this and I just wanted to let you all know, its all going to be okay. I'm trying to use flipboard now. Ugh. Thanks for this! No panic for me now. I've read so many posts on this topic and you've made it so clear, I understand now, so thank you aha. This was so helpful! Thanks for this post. Thanks a ton for demystifying the helpful alternatives.